A thoughtful, gentle, earth-friendly reminder that real connection starts the moment we disconnect. Caring for your mobilhome: From time to time you can vacuum it with the soft brush attachment. It can be dry-cleaned. Choose a cleaner who is familiar with the special care of wool. If you spill something on your mobilhome blot it away quickly and gently before absorption occurs. Avoid rubbing, as this will change the surface of the fiber. 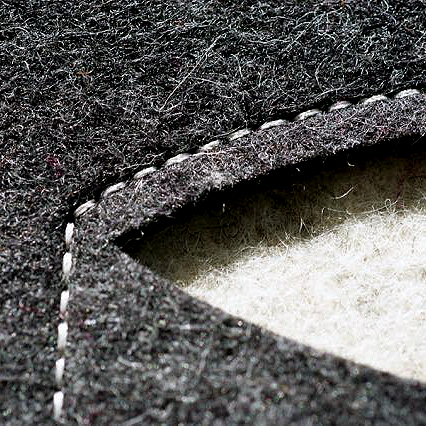 About felt: Wool felt is one of the oldest human-made textiles. It is made from sheep hair that has gone through a wet felting process of matting, condensing and pressing. It is high quality, durable and eco friendly. Wool felt is also a rapid renewable resource and is completely biodegradable. mobilhome stand: Hand made unfinished fir stand for your mobilhome. Alternative solution to hanging on knobs or hooks. Sits perfectly on entry way table, desk or floor. Hand made iron ball push pin. Collapses for easy storing. 23"tall. Made to order for your mobilhome. Please email for inquiries.